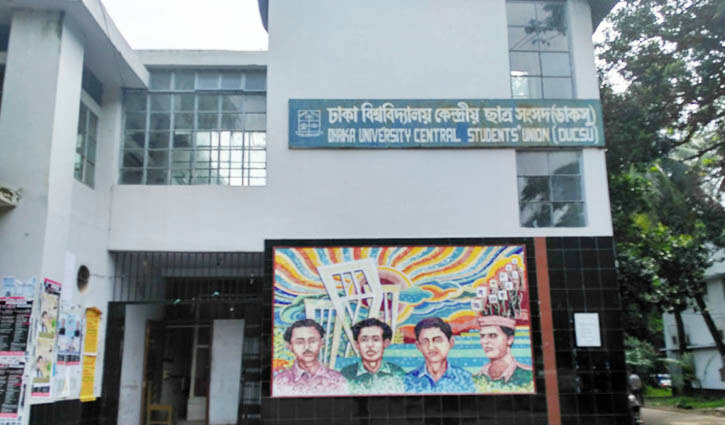 Staff Correspondent: The ruling Awami League’s student wing Bangladesh Chhatra League (BCL) on Sunday announced its 25-member full-panel for contesting the upcoming Dhaka University Central Students Union (DUCSU) polls schedule to be held on March 11. BCL President Md Rezwanul Haque Chowdhury Shovon, General Secretary Golam Rabbani and its DU unit General Secretary Saddam Hussain were announced as vice-president, general secretary and assistant general secretary candidates for the polls. The BCL DU unit president and organization’s chief coordinator for DUCSU polls Sonjit Chandra Das announced the organization’s panel for DUCSU polls along with VPs and GSs candidates for hall union polls at a press conference at DU’s Madhur Canteen on Sunday afternoon. Other candidates of DUCSU polls are Saad Bin Qader for liberation war secretary post, Arif Ebne Ali for science and technology secretary, BM Lipi Akhter for common room and cafeteria secretary, Shahrima Tanjina Arni for international secretary, Mazharul Kabir Sayan for literary secretary, Sham-e-Noman for cultural secretary, Shakil Ahmed Tanvir for sports secretary, Rakib Hawlader for students’ transport secretary, Azizul Haque Sarker for social services. The 13 executive-member are Chibal Sangma, Nazrul Islam, Rakibul Islam Oitijhya, Tanvir Hasan Saikat, Raisa Naser, Sabrina Etee, Ishat Kasfia Ira, Nipu Islam Tanwi, Haider Mohammed Jitu, Tilottoma Shikder, Julfiqar Alam Russell and Mahmudul Hasan. For the hall union polls, BCL nominated Akmal Hossain and Mehedi Hasan Santo as VP and GS candidates respectively for Bangabandhu Hall, Abdul Alim Khan and Abdur Rahim as VP and GS for Sir AF Rahman Hall, Julius Cesar Talukder and Kamal Uddin as VP and GS for Salimullah Muslim (SM) Hall, Sajibur Rahman Sajib and Nazmul Hasan Nishan as VP and GS for Bijoy Ekattor Hall, Abdullah Al Subayil and Hasibul Hasan Santo as VP and GS for Muktijoddha Ziaur Rahman Hall, Farhad Uddin and Imam Hasan as VP and GS for Poet Jasim Uddin Hall, Saifullah Abbasi (Ananta) and Rifat Uddin as VP and GS for Sergeant Zahurul Haque Hall, Touhidul Haque Shishir and Mizan Hasan as VP and GS for Haji Mohammed Mohsin Hall, Utpal Biswas and Kajal Das as VP and GS for Jagannath Hall, Ariyan Jaman Khan Sohan and Siam Rahman as VP and GS for Master Da Surya Sen Hall, Hussain Ahmed Sohan and Irfanul Hai Sourav as VP and GS for Shahidullah Hall, Shahriar Siddiq Shishim and Mahfuzur Rahman as VP and GS for Fazlul Huq Muslim Hall, Tamim Reza and Ahsan Habib as VP and GS for Amar Ekushey Hall. For female dormitories, Kohinur Akhter Rakhi and Sara Binte Jamal were nominated as VP and GS for Bangamata Sheikh Fazilatunnesa Mujib Hall, Israt Jahan Tanni and Saima Promy as VP and GS for Rokeya Hall, Jesmin Shanta and Umme Arafat Jahan Lucky as VP and GS for Shamsun Nahar Hall, Israt Jahan Eva and Shahriar Sultana Nadi as VP and GS for Kabi Sufia Kamal Hall, Razia Sultana Katha and Sawlin Jahan Senjuti as VP and GS for Bangladesh-Kuwait Moitri Hall.